‘Do you still not have compassion for me?’ asks Purandara Dasa (1484–1564) in this beautifully melodious song of his ishta daivam (God of choice) Vitthala. ‘I have been re-born in many countries, in many periods of time, in many wombs. Having fallen in the hell of ‘me’ and ‘mine’, (do you not have compassion) for this devotee who believes that you are the only refuge?’. Purandara Dasa talks of reincarnation and Karma in this song. Did you know that reincarnation is not Vedic thinking but comes somewhat afterwards? It starts getting mentioned in the Upanishads period (around 700 BC) but is most clearly stated later, in the Bhagavat Geeta (around 200 BC or later). Below is the oft-quoted verse which serves as a definition of reincarnation. Just as (yathA) people (nara=individual and aparANi=others) discard (vihAya) old (jIrNa=old) clothes (vAsa) and put on (verb graha) new (nava) ones, so do (taTHA) the souls (dEhI=the embodied soul) discard (vihAya) old (jIrNa) bodies (sharIra) and come into (samyAti) many different (anya anya) new (navA) bodies . Reincarnation is the natural progression of a couple of ideas a few thousand years older. These ideas are like the building blocks of Hinduism. The first one is the idea of body and soul. The Atman (soul) which lives in the sharIra (body) is eternal, immutable, is neither born nor can it die. It is due to avidyA (ignorance) that the soul gets caught up in a body. ‘Ignorance of what?’ you may ask. Ignorance of the fact the the soul is indeed Brahman, the Supreme Consciousness. When the Atman gives up its false individuality and realises that it is Brahman (aham brahmAsmi=I am Brahman, from Brhadaranyaka Upanishad, app. 1000 BC), it is then ready to merge with the ultimate divinity. The second important idea which led to the principle of reincarnation is that of Karma. It is the law of cause and effect which applies to each individual. Every action, good or bad, produces consequences which the individual will need to experience. The difficulty of fitting all the consequences in one life led to the idea of reincarnation. Yet it is easily evident that when the individual is in the process of experiencing one set of consequences, he or she is doing other actions in the meanwhile so this cause-effect can never be terminated, even with multiple births! Here then, we need Divine intervention for Moksha (release from this cycle of reincarnation), for once we realise that the Atman is indeed the Brahman, what need to we have to continue this never ending cycle ? Coming back to my song choice of the day, if we look at the lyrics with the above ideas, we can better understand what Purandara Dasa was talking about. After mentioning his rebirths, he says that he finds himself in the hell of ‘me’ and ‘mine’. Attachments and ego are causes of accruing more Karma debt thus forcing us into further lives; if one knows that one can merge into Brahman, then life will seem like hell and attachments seen as ropes which tie us to this hell. Purandara Dasa then does a very clever thing, he says ‘Whatever I have done by mind, body and spirit, I offer to You’. If he offers to God all his actions, then doesn’t he also offer God all the Karma debt which arise from it? This is an acknowledgement that eventually the only way to escape this cycle of life and death is by Divine intervention. Whatever I do with my body (kAya), speech (vAcha), mind (manasa) , senses (indriya), intellect (budhdhi) and soul (Atma), or with my innate natural (prakRuti) tendencies (svabhAva), I do (karOmi) them all for others (para asmai) and offer/dedicate (samarpayAmi) everything to Lord Narayana! This song has been set to the very pleasant raga Kalyana Vasantam. To know more about this raga, click here. To present this song, I have chosen a rendition by Bombay Jayashri whose voice quality always leaves me in awe. For an instrumental version, I really enjoy Kadri Gopalnath’s rendition on the sax. As I do not speak Kannada, I have transcribed the song in Devanagari script using internet resources and listening carefully to multiple versions of the song. Translation is based mainly on various internet resources, so I am unsure of accuracy. Do you still not have compassion for this devotee (literally slave, servant) O Hari, the supreme Lord who lies on the serpent-bed. I have been re-born in many countries, in many times, in many wombs. Having fallen in the hell of ‘me’ and ‘mine’, (do you not have compassion) for the devotee who believes that you are the only refuge. I offer to you all that I have done by mind, speech and body, O slayer of demons. Whatever I do, my soul is yours, o Lord, consort of Sri (Lakshmi), (do you not have compassion) on this devotee of Purandara Vitthala. Yashoda and Krishna – who doesn’t understand the bond between them? They stand as an example of the mother-child relationship and its innate divinity. 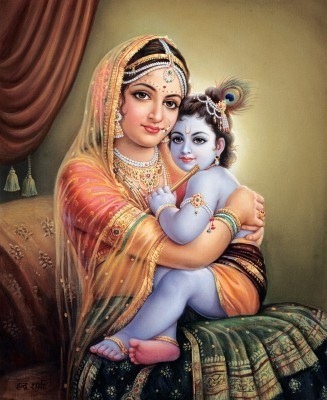 Its interesting that we seldom mention Krishna’s birth mother Devaki as His mother. Motherhood is indeed far more than bearing a child in one’s womb. What kind of mother was Yashoda? She loved her little Krishna, that goes without saying. She was strict at times, tying Him down when he was especially naughty. She turned a blind eye at other times, ignoring the butter He stole with his friends. She was supportive when needed, defending Him against the complaints of the other ladies of the community. And she let Him leave her and go far away when it was time to undertake what He needed to do. In effect, she was a mother like most mothers. Did she know He was the Lord? How could she have missed it? He performed miracles like slaying demons when He was just a babe, showing the world in His mouth when she demanded to see if He was eating butter, by multiplying Himself to dance with all the Gopis. So she knew and yet she didn’t know, for when He behaved as a child, she treated Him as a child. That then is Maya, the illusion which we all suffer on earth. The same Maya which makes us ignore the divinity of each soul around us and the presence of God everywhere. How reassuring to think that one can love God in the same manner as one loves one’s child! Today I present a song which celebrates this maternal love. It is also a commentary on Maya because even Yashoda was blinded by it. Purandaradasa (1484-1564) writes ‘Yashoda played with the Lord of the Universe, thinking Him to be her son’. The song is written in Kannada and is set to Raga Kapi. If you would like to know more about this raga, click here. The song was made famous by the great vocalist M.S.Subbulakshmi. Today I present an instrumental version by the Saxophone Maestro, Kadri Gopalnath in a jugalbandi with Pravin Godkhindi on the Bansuri (flute). Now listen to this rather modern vocal rendition by Bombay S.Jayashri whose voice is a great gift from God to us listeners. Post Script: It has been a long time since I posted this but today I came upon this soulful live rendition by T.M.Krishna and felt that it too should be included in my post. There are songs which I like in a female voice and others in a male voice but for this song, I cannot quite make up my mind! Yashoda played with the Savior of the world. Thinking that the Savior of the world was her son, Yashoda played with embodiment of all great qualities. The one whose greatness is infinite and beyond measure, Yashoda played with the gem amongst children. The one who is smaller than the atom and bigger than infinity, Yashoda played with him. The one who is the supreme being, son of Vasudeva, the Vitthala of Purandara (note: the composer’s signature), Yashoda played with him. Oh, Goddess of Fortune ! Lakshmi Devi ! Please come! Slowly and surely, like butter coming out of buttermilk, come placing one feet after the other, your anklets ringing. O Daughter of Janaka who shines like countless suns, shower us with a rain of gold and fullfill our wishes. Without moving around, stay forever in your devotees’ houses, receiving daily services and worship. ‘Welcome Lakshmi, Goddess of Fortune’ Purandaradasa (1484-1564) says. Who would not welcome this Goddess who brings prosperity, wealth and good fortune to us? 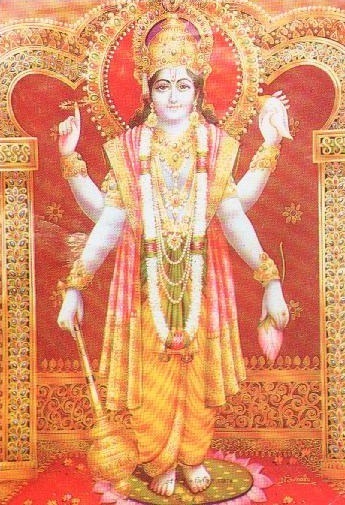 For 20 years or so I have been reciting the MahaLakshmi Ashtakam every morning and evening. I am convinced that it is this, my invoking Her name, which brings whatever good fortune that has come into my household. It is my mother who advised me to say prayers to Her; the picture above is the one which hung in my mother’s prayer room. My mother is gone now and as I sing the names of one mother, I remember the other as well. In these neural pathways I call my mind, there is an intricate web made of musical notes and when this web is cast, it captures memories and beliefs, love and worship. It captures life. Purandaradasa is considered to be the father of Carnatic Music. He composed mostly in Kannada, like the song featured today. He too worshipped at the portals of Lakshmi, being a rich pawnbroker and jewel merchant until he was 30 when realisation dawned and he gave it all away to become a wandering minstrel. Purandaradasa was the guru of Swami Haridas, who was the teacher of the great Tansen, musician extraordinaire of the Mughal court, as well as Baiju, another great musician of the Hindustani tradition. This shows the strong links between Carnatic and Hindustani music sampradaya in those times. In spirit with this harmony between the North & the South, I present the song in both Carnatic & Hindustani styles. The first clip is by M.S.Subbulakshmi, and the song is rendered in Carnatic tradition in Raga Madhyamavati. To know more about this raga, click here. The second clip is by Nithyasree Mahadevan in Raga Bauli. I have a great liking for this raga! To know more about this raga, click here. The third clip is from the Kannada movie Nodi Swamy Navirodu Heege (1983) sung by Hindustani Music stalwart Bhimsen Joshi. (Sorry, I could not find a better quality video). What a mastery he has over whatever he sings!! Ah, I still mourn his loss. Something that caught my attention : the actress in this clip is the appropriately named Lakshmi! Language : Kannada. As I do not speak the language, find below the lyrics in devanagri script. I have consulted sources, listened carefully and transcribed as best as I can but I am unsure of accuracy, given the difference in vowels and pronunciations. Oh, Goddess of Fortune ! 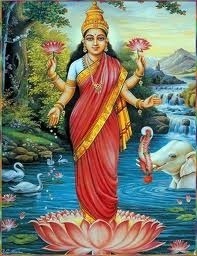 Lakshmi Devi ! Please come (implied: to my house). Like butter coming out of buttermilk (slowly but surely), come, placing one feet after the other, your anklets ringing. O Daughter of Janaka who shines like countless suns, shower us with a rain of gold and fullfill our wishes. Without moving around, stay forever in your devotees’ houses, receiving daily services and worship. You shine like a beautiful doll in the minds of saints. O elegant queen of Venkateshwara (Vishnu)! O Lotus eyed one! You who wear golden bracelets and are decorated with Kumkum, please come and bless with infinite prosperity. O Consort of PurandaraviTala! O Queen of Alagiri Ranga! You who shine in the hearts of safes! Come to our Friday worship when streams of ghee and sugar will flow!